Monday was the second day held at the University of Oklahoma known as Digital Humanities Day. Both of these experiences have been rich not only getting to meet new faculty who are doing interesting projects but see the tightening of a great community here at OU. One of the projects mentioned was also one the most exciting projects to see unfold over the Fall semester on OU Create was through one of our dream courses, Making Modern America: Discovering the Great Depression and the New Deal. For whatever reason, I had yet failed to really dive into it so I took some time today to do so. Several of the projects in which I highlight, including my own, focus on students building and critically examining one’s digital identity through personal domains and webspaces. I’m equally as interested in how other projects can be beneficial from simply having broad access to modern web tools to propel other disciplines. The beauty of domains is that they aren’t just one thing. An address can take you anywhere. Though I’m no historian, I’ve been told by multiple historians that there are conventionally two ways to teach history: 1) one can tell and recite the stories of the past in efforts to build up an appropriate body of historical knowledge from which we can make informed decisions as a citizenry and 2) doing history. That is, to do as a historian would and gather/interactive with source materials in efforts to uncover new insights into mankind’s history. Of course, I’m not saying one way is better learning than another. In fact, one could easily argue that for anyone to truly do history well, they would naturally have to have enough interaction with previous works of the field, so it makes sense for both of these philosophies to coexist (even online). Created by students at the University of Oklahoma, this site documents and explores the 1930s and its enduring legacies in Oklahoma. Please explore the digital exhibits and collections of photographs, documents, videos, and maps discovered and created during the research process. If you were to browse the collection, you would see that OU students gathered a total of 903 items collectively of the semester and entered them into the website using the content management system Omeka. Omeka was developed by George Mason University and the Roy Rosenweig Center for History and New Media as a lightweight online digital collection CMS. One interesting use case is that the Missouri School of Journalism uses it to archive 38k+ photographs from the Pictures of the Year International contest. Additionally, Omeka is easily installable on OU Create as we have it included as a one-click install option in Installatron. Each “item” in an Omeka site is tagged with all the necessary metadata. So, for instance, I searched for items that pertained to my hometown of Yukon, Oklahoma, and I find a picture of Chisholm Trail Park. Based of the data I can see that this was taken by a student named Autumn on December 13, 2015, in a jpg format. It also looks like I have multiple ways of access both the image as well as the metadata (atom, xml, json). Items can also be curated into exhibits and exhibit pages which looks nice. One of the projects I thought that looked really fun from the student perspective was state tours. From what I can tell, they were literally assigned to go on a road trip. So this particular project looks really, really interesting. In 1941, a WPA program in Oklahoma called the Federal Writers Project published a book titled Oklahoma: A Guide to the Sooner State (you can find a beautiful scan on archive.org). The foreword was, in fact, written by William Bennett Bizzell, who was president of OU from 1925-1941 and whom the library bears the name. BETHANY, 6.9 m. (1,212 alt., 2,590 pop. ), is primarily the home of members of the Nazarene religious sect. Under the terms of the town’s charter there are no theaters, billiard halls, or beauty parlors; and the sale of tobacco and intoxicants is forbidden. Even billboards advertising these articles are banned. YUKON, 13.9 m. (1,298 alt., 1,660 pop. ), an agricultural and milling center, was laid out in 1891 by the Spencer brothers, who owned the 160-acre site. Frisco, a small town of one thousand population, had been established near by; but when a railroad was built through Yukon, most of Frisco’s people moved there. The large flour mills on the eastern edge of Yukon dominate the town’s commercial life as well as its buildings. Yep, we are still known for the flour mills although its now just merely symbolic as they haven’t been used to store flour for some time now. The Frisco piece is interesting. My grandmother still lives out close to where (I assume) Frisco used to be located. While she still refers to a specific street as Frisco Rd, it’s no longer labeled that. The only reminent of Frisco is the old Frisco cemetery. But this makes total sense how the railroad drew people farther into the town of Yukon. #RIPFrisco. Each tour consists of multiple exhibit pages that students have authored, a interactive map, and a video recording of the tour which has been uploaded to YouTube. The interactive map is an Omeka plugin called Neatline that my colleage John Stewart discovered and recommended the students look at. Neatline allows you to overlay Omeka items onto a map as a means to build a geotemporal visualization and narrative. Neatline works best when you’re using it to tell a story or create an interpretive lens through which a collection of artifacts, documents, or richly-described concepts could be understood. There’s also a lot of great OU history built into the site as well as a few different campus buildings, all of which exist to this day, were originally WPA projects. There’s probably a real good metaphor here on facilitating students learning on how to construct archives on the construction of learning facilities. This reminds me that I need to give a big thanks to Sarah Clayton, the digital scholarship special in OU Libraries, who really put in a lot of effort to get the site working like a well oiled machine. Our library is off the charts! As a project, I’m completely captivated by what the students have pulled together in one semester both as a proponent of these types of meaningful projects and as an Okie. This site has real, tangible meaning to me, and I wouldn’t have even known this course existed had this artifact not been constructed. Even moreso, this class was a Presidential Dream Course, a course funded by the administration to take place once. Now we all get to benefit from what those generous funds. It only makes sense that courses that turn students into historians disseminate that work on a space that is as accessible and attractive as this one. I’m excited to dive in and swim deeper into the site. All in all, students uploaded and archived 46 historic photographs, 27 historical documents as well as produced 54 new photographs, 20 videos, and 25 interactive maps. Hop over to newdeal.oucreate.com when you have a chance. It’s a real treat. 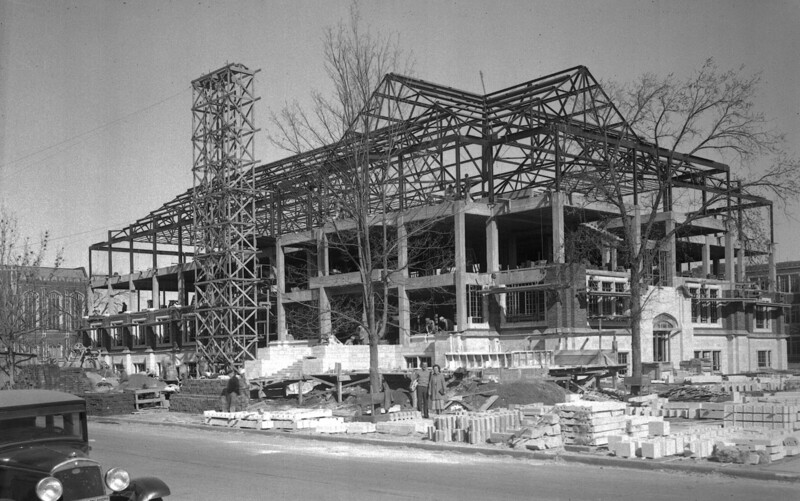 Heffner, Roy E. , “Southeastern View of Construction of Adams Hall,” Making Modern America: , accessed February 3, 2016, http://newdeal.oucreate.com/items/show/478.